This plugin splits an image into tiles and saves them into a zip file. Large image and tile sizes may be slow to save. This is absolutely incredible. Fast turnaround and everything. Nice work. Improved the performance with large images, increased the maximum tile size to 2048. File version updated to 1.0.0.1. It can be frightening at times. I always try to use it for good. Did you mean 'FlieTypes' folder? Perhaps I'm just tired .... tomorrow is another day! You will find this plugin in the "Save as type:" box of "Save as...". 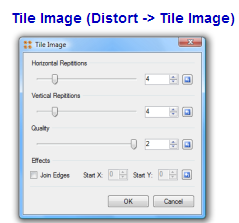 The name is there 'Image tiles (*.zip). But maybe you are looking for Chop Up and Save (Effects->Tools) which works simular but allows you to see the tiles in the canvas. I just tried it in FileTypes but on Pdn 3.5.11. It shows up as a choice when you go to save (though I do get an error - most probably my mistake). You say it used to be found under Effects/Distort? May you be thinking of another effect? 'Tile Reflection' or 'Tiles Reflection XY' or even 'Tile from clipboard'? Select the 'Menu' button and click on 'Distort' and it will suggest plugins in that submenu. Or try the keyword 'Tiles'. Hey guys - thanks for your input. This is what I'm looking for and will try to find the download tomorrow. Thanks so much @Sasha - I've now downloaded it. @EER I have managed to get the Tile Image to work OK in v4 ................ so far . Good to know. It must not use the "common" resource file that seems to be conflicting with PDN4.